I come here to seek advice for my mother who received a writ from Hong Leong bank lawyer which claim my mother has owe credit card debt of RM14K. My mother's supplementary card holder has been involve in lucky draw con case in year 2015 which her credit card has been swipe of RM9xxx. We have lodged a police report, and file disputes with Bank Negara Malaysia (BNM) and Hong Leong but were unsuccessful. Along the year, my mother was still using her card which caused the interest being charge on the outstanding amount. However, starting this year, my mother has stop using the card, and caused Non-performing Loan (NPL) to the card. The bank has been calling to request for payment of RM 12xxx which inclusive of the principle amount and interest charges. Although my mother has proposed to settle for full payment of RM10k, the bank refused and now they issued a writ to my mother. This is our first time dealing with court case, seek advice from all sifus on the next course of action. The court order is on 12 November 2018, and the letter was issue on 12 October 2018 but we only receive the letter today. Our hope is we want to settle the case with the principle amount as an installment basis/full payment but the bank refused to talk. Post image of the Writ and Statement of Claims here for clarity. Also post Letter of Demand ( if got ). Who is holding the supplementary card? Your mother? If you want to fight this Writ, you need to file in a Notis Kehadiran ( Notice of Appearance ) at the Court counter as soon as possible, latest is 3 days from today. If you don't file the Notice of Appearance soon, the Court will let Hong Leong Bank win and will order your mother to pay the full amount plus costs. Prepare a draft of your Notis Kehadiran and post it here for checking. My mother is the basic card holder, and my sister is the supplementary card holder. 1) For this Notis Kehadiran, does is mean we can set the date to attend the court? 2) My mother needs to send this Notis Kehadiran to Mahkamah Majistret Kuala Lumpur personally, or I can help her to send it? 3) We would like to transfer the case to my mother's place which is in Sabah, what should we do? 4) Currently we have negotiation with the bank, but the discount given was miserable. Is there possibility we can get better offer if we bring this case to court? AMBIL PERHATIAN bahawa defendan mempertikaikan tuntutan Plaintif dan ingin menggunakan khidmat peguambela dan peguamcara. No, that date is already set at the Writ. Check it. But you need to file in this Notice much earlier before the date to attend. If the counter people do not accept, then your mother has to quickly come to file personally. Answer the questions below first. Where is your mother staying now? 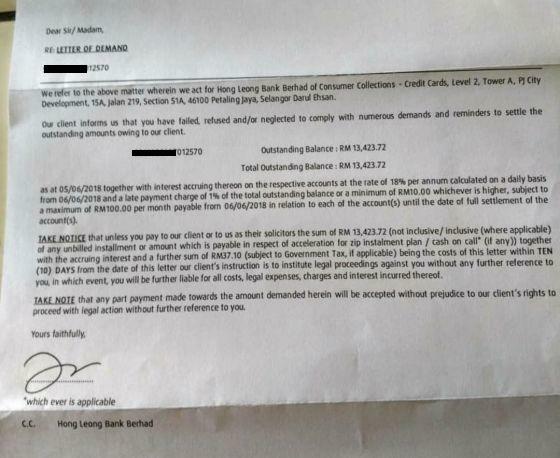 Did your mother apply the credit card at Sabah Hong Leong Bank? Was your mother staying in Sabah when she first applied for the card? Usually the harder you fight, the better offer you will get. Don't delay, file the Notis Kehadiran first, as soon as possible. yes, she was staying at Tawau Sabah when she first applied for the card. If the counter people do not accept, then your mother have to quickly come to file personally. I will go submit tomorrow. If they do not accept filing that means my mother has to fly here on the same day, is that worth the trip? What if we settle with the bank with the discounted amount after the due date of the Notis Kehadiran, the bank will charge us on all the court fee?